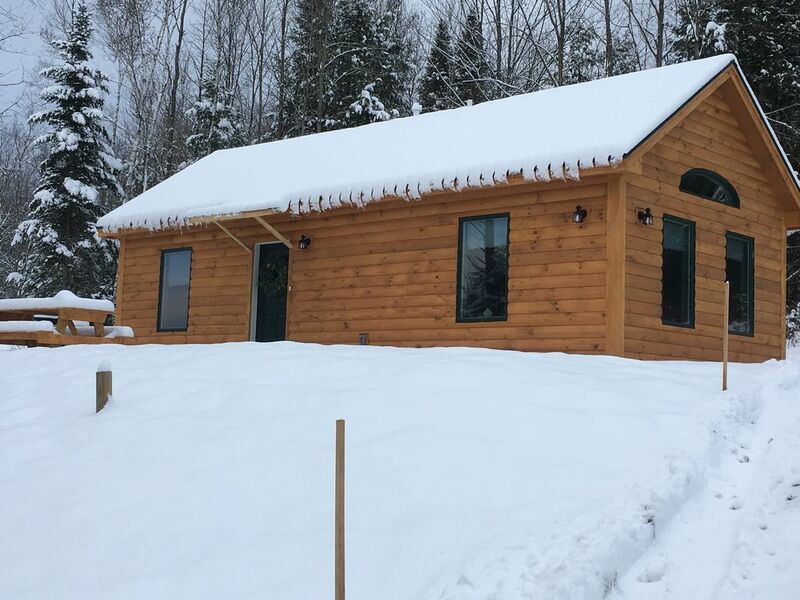 Our cabins are nestled in the woods of the Green Mountains and only a short distance from ski resorts, hiking/snowshoeing trails and several breweries. Even though you feel that you are away from everything in the serene woods, you are only 3 miles away from local restaurants, and shopping centers. We have a binder in the cabin with the local places to eat, shop, breweries and other local activities. We are located on a country road in the woods, but only 2 miles from restaurants, breweries and local shopping centers. You will love looking out the large windows or being outside enjoying the campfire or the singing of the birds. toilet, shower, This is our ADA unit with roll in tiled shower. We live on a back country road but only 2 miles from shopping, breweries and restaurants. It is a beautiful ride to our property. We do have a hillside and farmland view. We have a hot plate. We have a wet bar with many cooking appliances. See the pictures. We have a few. If we know the ages of the children, we will try to accommodate if requested. Clean, cozy and wonderful hosts! My partner and I stayed in Jennifer and Craig's cabin during a blustery winter storm this January. The cabin was warm, the amenities were perfectly suited for the weather and the kindness Craig showed when our car became stuck going up the hill was very helpful! Would highly recommend to any couple looking to get away and "unplug" from the hectic day to day. Thank you, Jennifer and Craig! Our stay at Serene Country cabins was great. The cabin itself was absolutely lovely, so well designed and decorated. As a wheelchair user, I was totally impressed with the accessiblity features of this cabin. We had a few special needs during our stay, and Jennifer and Craig helped us quickly and with great friendliness. I highly recommend their cabin. The cabin was cozy and perfect for a romantic getaway! We utilized the campfire and grill and the property managers were quick to address any items that were not working. 10/10 would recommend. Thank you for staying with us. We are glad everything worked out. Thank you for leaving the cabin in great shape. We appreciate that. Please come again. Cute little spot, exactly what we wanted! Thank you so much for your cabin, was the perfect place to unwind after our wedding! Thank you again for staying with us. We are glad you enjoyed yourselves. Best of luck on your next journey in life. Thank you and congratulations. Please come again. We appreciate how clean you left the cabin. Great get away from it all !!! Super clean and comfortable. A lot of little extras that make it nice. Would absolutely stay there again.